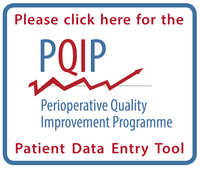 PQIP is a new initiative from the NIAA-HSRC, working on behalf of the Royal College of Anaesthetists and a broad range of stakeholders, aimed at improving patient outcomes from major surgery. PQIP measures complications, mortality and patient reported outcome from major non-cardiac surgery. The ambition is to deliver real benefits to patients by supporting clinicians in using data for improvement. The pilot programme is being supported by the Health Foundation, who are funding research which will develop our understanding of the barriers and enablers to quality improvement at local level. PQIP is a truly multidisciplinary initiative, and we have support from surgeons (through the Royal College and a number of surgical specialist societies), critical care, allied health professionals, and patient groups. We hope that following a successful pilot, that we can up-scale PQIP to cover most, if not all, NHS hospitals offering non-cardiac surgery over the next 5 years. Please visit our website: www.pqip.org.uk. PQIP Bulletin Article (May 2015).pdf (127 KB). If your hospital would like to participate, please get in touch at: pqip@rcoa.ac.uk.